A relationship can overcome practically anything if the act of betrayal has not resulted in a severe sever where fear has overtaken the injured partner to the point, he/she is too fearful to trust their partner again. If you’ve put your partner in that place, you have created an end to the beginning, and set in place the beginning of the end to your relationship. You have breached not only the trust factor, but also the emotional intimacy, which is an integral component in which all healthy relationships are built. It would be wise to know your partner’s tolerance levels of emotions; and the various frustration levels in which he/she will or will not forgive. Knowing your partner in this way will help you to properly gauge all that you must do to repair what you have broken. 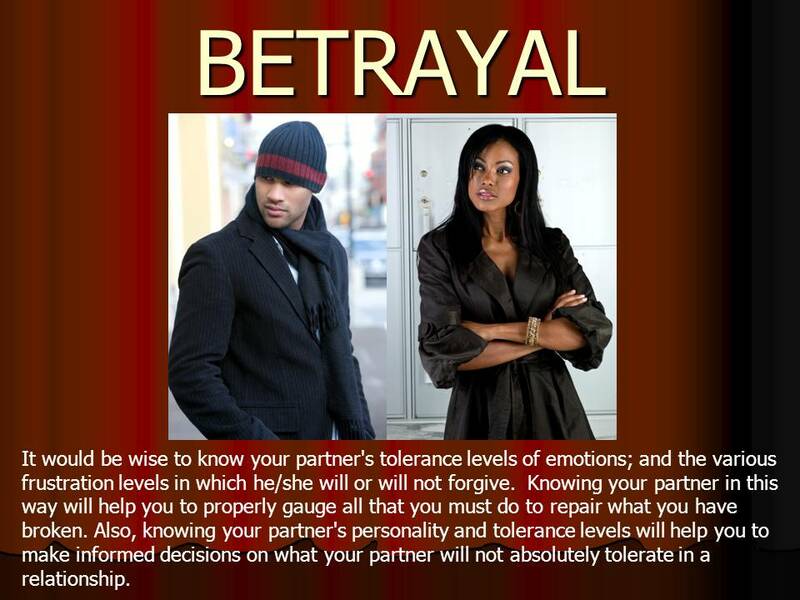 Also, knowing your partner’s personality when it comes to how they will process betrayal, will help you to make informed decisions on what your partner will not tolerate. If your partner is easily frazzled, it is safe to deduce your partner has minimal to zero tolerance for letting things go. You can confirm this by listening to his/her responses when in conflict with friends and family. Observe and study the levels of frustration they have with situations. This partner is not a very good listener. Repeating yourself will be necessary in explaining what exactly happened and why, because he/she will draw their own conclusions. Some partners lack emotional fortitude where one offense, or one wrongful act, is extremely difficult to deal with. If you have this type of partner, you must bear the responsibility of always staying on point. If you do not, your wrongs may not always be thrown in your face, per se, but they will remain a watermark in the blueprint of your relationship. You may experience a shutdown in conversation. This partner does not have a lot of room for talking about something you’ve done that has caused him/her to deal with pain. Or you may have a partner where more consideration is given first as to why you did it, and whether he or she is somewhat responsible for what you’ve done. They will work it through to make a fair determination as to whether there was any part he/she may have played in what you did. You will feel some distance from them sometimes, but their presence is symbolic that they are hanging in there, for now. You may feel a chill at times, but it means he/she is working through it. There is the logical partner. They appreciate your honesty in telling the truth. It is always better to confess to this partner. If he/she catches you in an indiscretion, it will be very difficult to deter them from rationalizing something they’ve seen firsthand. He/she is primarily driven on the “why” versus the act alone. There will be a full discussion on the events leading up to the act, the act itself, and the after affects of the act. There will also be a probing as to where you are with your apology, and how much sincerity it carries. A moving forward plan will be put in place in order to ensure progress, rather than being stuck in that bad situation’s moment and time. If you have a partner who has emotional issues, he/she will only engage in what they are feeling about. Since this partner type is more self-centric; you will continually live in the moment of your wrong doing and will be forced to remember what you’ve done, more than you will care to remember. Even if this partner bears some remote responsibility of what you’ve done, he/she will never own it. This same partner just might turn around, do you an injustice and feel justified because of your injustice. Regardless of where your partner fits on the forgiveness scale, the degree of your “relational transgression” will determine just how much work you will need to do in order to perform emotional repairs— if you are truly interested in saving the relationship. Of course, it is always best to err on the side of keeping everything above board. But things do happen…..
Making amends is hard, but not impossible. How you do it is critical. Your focus must be on rebuilding trust and working to become someone your partner can re-invest their emotional trust in. Be prepared that it may not happen any time soon in most cases, but your continual apology in word and deeds will eventually open the portal to forgiveness. Your transparency of living must be extremely apparent in a way where it is done with ease and not forced, because forced transparency results in suspicion and further distrust. You may have to share more of your whereabouts and communicate more to your partner, but it is necessary— should you care to rebuild. When you mess up, you must take on the burden of your partner’s feelings. If you cannot do this, and feel the pain you have inflicted, you will fail in gaining your partner’s forgiveness. You must be sorry. You must say it. Not once, twice, three times, four, five, or even six. You must say it as many times as it takes for your partner to feel your sorrow. Being sorry is not about blame, where you are saying, “…well if you had done this, or if you had not done that, I would not have done this.” No. This is only about your act— you alone are at fault. A sorry and sincere heart in humility, along with extreme vulnerability and transparency, is a great start to re-establishing trust. Don’t push and don’t try too hard. Show much love to your partner, be patient and be consistent. You may be taking a risk, because in some cases all of your gestures may not work to rebuild your relationship. In this case, you may have to make a decision, but nothing beats a failure but a try, if you care to try to save your relationship. This entry was posted in Settling and tagged Betrayal in a relationship, how to fix your relationship when you have done wrong, relational transgression, repair the damage in your relationship, will my partner forgive me. Bookmark the permalink. I’m the partner that did not ever let it go. One lie. A lie that was spoken on purpose with the intent of manipulation. I never recovered the ability to trust him again. All factors included, it was a bad time for a lie, it was the worst lie he could have made up, it was done to manipulate me. It was too much like my family of origin….and I could not let it go. It’s better now, but there is no trust and no relationship. The part that is better is that I know why he did it and what motivated him, I know he was afraid of losing me and so he made up a story he had no idea would have such a huge impact on me when it came out. It’s sad now, rather than angry. I think, sometimes, the betrayal is a complex issue…you gotta know who you are dealing with and know where the lines are…even if they may not.